No excuses allowed today. This cardio workout for women is where the fat burn happens. 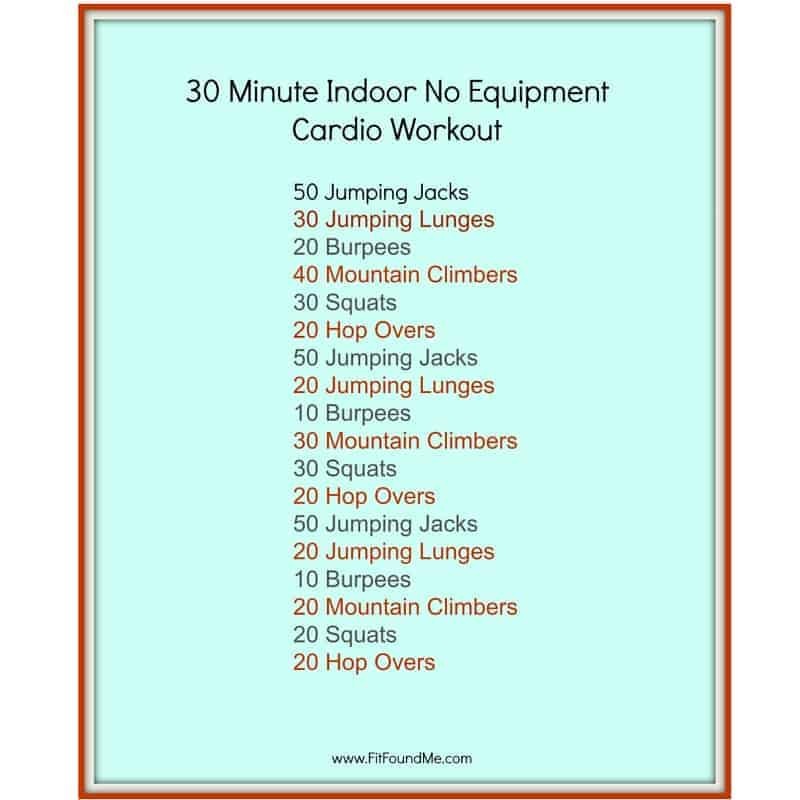 Calories are waiting for you to burn them away with this 30 minute indoor no equipment cardio workout. Fitness for women over 40 should be a priority and this workout will help you fit it into your busy schedule. Taking the time to go to the local gym takes too much time and it would be too easy for me to procrastinate and end up not going. Working out at home takes away another excuse to workout. Quick, fast-moving cardio workouts for women are favorites of mine. These days, it seems like my list of things to do every day is so much longer than I can ever get to. My health is still a priority, and having quick workouts helps me maintain consistency. If you have a new goal or new commitment to losing weight, be sure to check out the weight loss page for some great tips, motivation and education on how you can be successful and reach your goals. Cool down: Stretch your muscles by doing some runner’s stretches, toe touches, raise your arms up and bend from side to side. Keep stretching until your heart rate comes down. Join the Facebook Group, Women Over 40 Losing Weight & Living Healthy. Aw, this was an exceptionally nice post. Taking a few minutes and actual effort to create a good article… but what can I say… I procrastinate a lot and never seem to get anything done. These workout tips for the home are really a life saver for a person like me. thanx, a lot for the content. I will surely try them out.